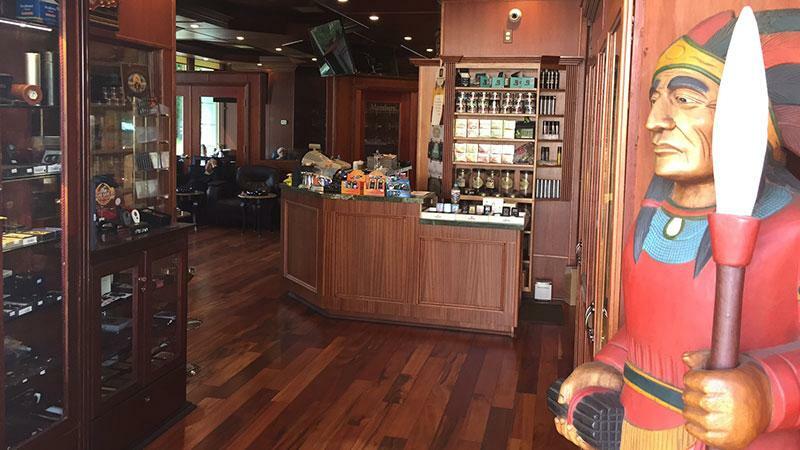 Fat Stogies Cigar & Lounge, located in the San Fernando Valley, has an excellent, well-stocked humidor featuring all your favorite brands and an open area lounge with comfortable leather chairs. It might be the most cigar-friendly road in America. In a stretch of less than seven miles along Ventura Boulevard, from Woodland Hills to the west and Interstate 405 to the east, there are at least seven cigar stores with lounges. Right there in Encino is Fat Stogies Cigar & Lounge, located in one of those San Fernando Valley strip centers that seem to be the result of questionable zoning laws. Fat Stogies, however, stands out. It faces the street and has parking in the back, a true bonus anywhere in Los Angeles. The shop also has an excellent, well-stocked humidor featuring all your favorite brands like Arturo Fuente, Macanudo, Rocky Patel, Padrón, My Father, Oliva, Ashton, La Flor Dominicana; and some names that are a little more difficult to find like Zino Platinum and Paul Garmirian (P.G.). Most of all, Fat Stogies is really comfortable. "Padrón and Arturo Fuente are the best sellers," explained owner Jack Abraham. "We also sell a lot of Montecristo and Romeo y Julieta because of the price point. Casa Magna does well because it's reasonably priced, but not as well as the Romeos because there are so many more blends." Abraham said that his customers are "100 percent loyal to their brands." That's why events aren't that well attended. "I have customers who don't care what Padrón costs," Abraham explained. "They're buying Padrón and nothing else." Like almost everywhere else, the pipe business is "way down" and accessories "are doing OK."
If you want to have a cigar at Fat Stogies, you must buy one there. An open area of comfortable leather chairs is just outside the humidor. TVs are visible everywhere. There is a separate room that would be a great blueprint for your own man cave if you had a dozen friends you could invite over. The interior walls are lined with overstuffed leather chairs, some in front of a floor-to-ceiling wall of lockers (rental is $1,500 a year, but they're all taken). This is where you can overhear talk of the Dodgers' prospects for the upcoming season and even join in if you like. The communal lighter gets tossed across a large coffee table in the middle of the room. It's a friendly vibe with generally welcoming hospitality. "We love cigars," said Abraham, who smokes seven medium-bodied cigars a day and owns the store with his brother Amo. The Lebanese brothers moved to the United States 30 years ago and have been in the same Encino location for two decades. "You love something and you end up a part of it." The walls of Fat Stogies are wood, a lustrous tan sheen comes off them when the light is right. The ventilation system works well, as nary a cloud of smoke was noticeable when the lounge was full. There are soft drinks for sale and the usual complement of cigar and pipe accessories. If you're in the Valley, Fat Stogies could serve as your cigar clubhouse on the go. Open Monday through Saturday: 9 a.m. to 10 p.m.